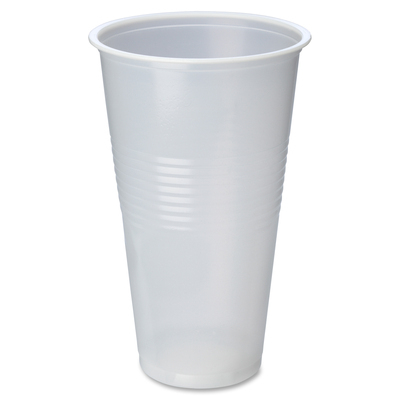 Translucent Cup Provides A Practical Way To Serve Cold, Refreshing Beverages To Your Guests, Employees, Customers And More. Smooth Rim Provides A Satisfying Sipping Experience And Is Rolled To Enhance The Strength Of The Sidewall. Ridged Exterior Creates A Slip-Resistant Surface To Prevent Accidental Spills And Messes As Condensation Collects. Disposable Design Allows Quick, Easy Cleanup After Each Use. Cold Cup Is Perfect For Daily Use, Company Gatherings, Picnics, Special Events And More..
Translucent Cup Provides A Practical Way To Serve Cold, Refreshing Beverages To Your Guests, Employees, Customers And More. Smooth Rim Provides A Satisfying Sipping Experience And Is Rolled To Enhance The Strength Of The Sidewall. Ridged Exterior Creates A Slip-Resistant Surface To Prevent Accidental Spills And Messes As Condensation Collects. Disposable Design Allows Quick, Easy Cleanup After Each Use. Cold Cup Is Perfect For Daily Use, Company Gatherings, Picnics, Special Events And More.